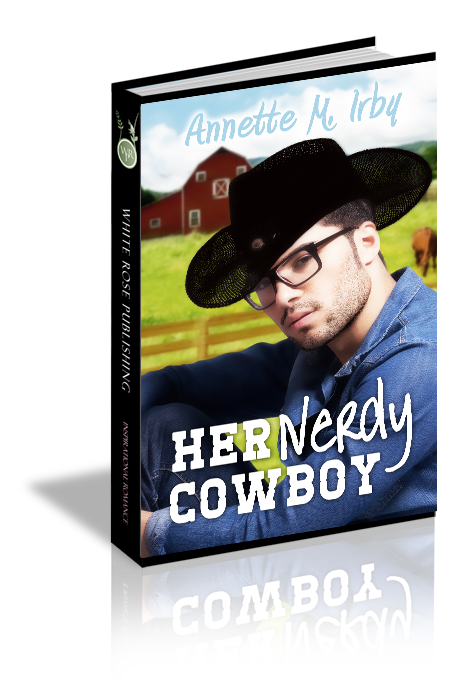 Whoever heard of a bookish cowboy? When Logan McDaniel’s brother-in-law dies, he steps in to help his beloved sister run her ranch. But what does a city boy know of herding cattle? Claire Langley loved her cousin. After he dies, she agrees to serve as a temporary nanny for two heartbroken children. Claire and Logan find they share a love of books, and Claire can’t resist the nerdy uncle who is great with children, and who reads to her of pirate romance. Claire’s ailing mother needs her in Seattle. Can she break away? And if she does, can there ever be a future for Logan and her? Logan McDaniels lugged his baggage through the airport. So many people wearing cowboy boots and hats. How in the world was he going to fit in here, what with his black-rimmed glasses and lean build? You never saw cowboys in glasses. Maybe they wore contacts. Now, that was a picture—cattle proddin’ macho dudes jabbing lenses into their eyes. He sighed to himself, glad his sister and bro-in-law stopped at two. Especially now. “Nope, they’re with the nanny. Lucy here wouldn’t stay with Nanny Claire.” Even now, the rug rat clung with white fists and wary eyes. Wait a minute. Back this truck up. “Your nanny?” Since when could she afford one? He reached for a bungee cord and checked the sky. Not a cloud. Then the horizon. No hills, mountains, bodies of water… anything. When had he agreed to come to Oz? He latched the bag and tugged the cord. “Comforting thought.” He spied an umbrella on the floor. Might come in handy. “Don’t say it.” He adjusted his glasses and faced the straightaway, which was indeed one straight, long, endless country road leading to his new adventure. Yippee. “Ha! You weren’t supposed to say it. Anyway, I’m trying to keep my geek status a secret. I won’t be accepted into the club if we’re not discreet.” He played at checking left then right. “And you being here is everything. It means everything.” Her voice went all raspy. He couldn’t handle that. Time to revert to razzing.